Nobody needs to point out that running a successful business in today's world is a challenge. Not only do you have to ensure your services and deliveries are top notch, every now and again, you have to ensure that you are doing things that stand out from what your competitor is doing. Standing out today has become the flag bearer of success and therefore a successful businessman, will not shy away from the tiniest tricks in the book that would help him gain an advantage over the competitors. 1) Installing a rooftop solar system on your office building automatically elevates the building stature, quite literally too. Thanks to the high rising or even the flush-mounted solar panels, the building stands out in the surrounding and attracts eye balls. It makes a wonderful impression on anyone walking into the building. Don't they say, the first impression is the last impression? Installing a rooftop solar system not just indicates that you are an environmentally cautious organization but also shows that you are a forward thinking and responsible entity, one that will do everything in its power to do things to help conserve the planet. Before you know it, you will become an envy of the neighborhood and seeing you, your neighborhood would go solar too. 2) Going solar ensures that you save a plenty on your electricity bill. A more detailed information for the same has been shared in our blog post specifically aimed at Industrial folks here. Moreover, with a fixed price of power for the next 25 years, you will be saving yourself from all the escalations that the coming years will bring. 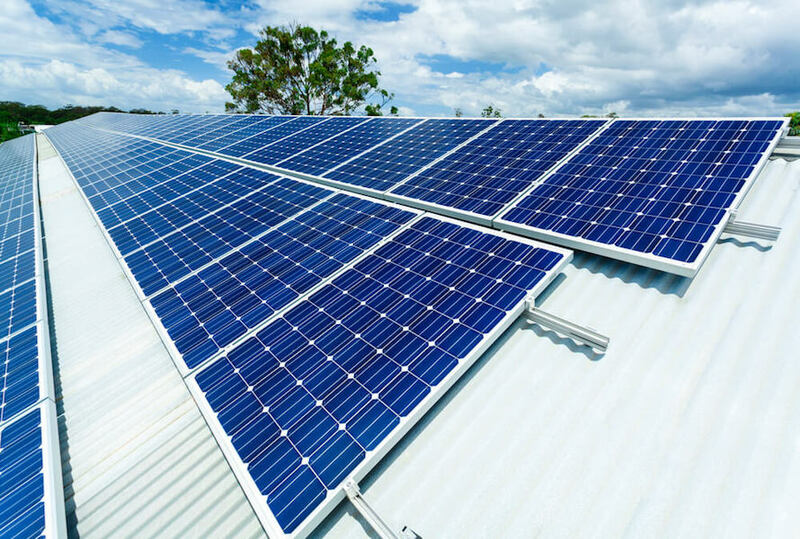 If you are a business that relies heavily on manufacturing or repair work, which demands a higher supply of power, going solar can be the best investment for you. In several cases, we have seen that a business can save as much as up to 70% of their current electricity bill by going solar. There is also accelerated depreciation (AD) benefits that can be availed for your business which would help reduce your tax liability when you invest into a solar system. You can always opt for Net Metering, in case you are producing excess power and get compensated for the same. All in all, going solar will not just help you save on your electricity costs but also earn credits if you do not utilize the power generated. 3) The costs of going solar have come down tremendously today. So you need not be a Fortune 500 company to take the decision. In fact, solar has achieved grid parity long back, with cost per unit being much lower than coal or Thermal power. The cost of solar equipment including the panels and the inverter has come down dramatically and affordability is no more a problem. There are several financing schemes that are available that make ownership even easier. Therefore, today, finances are the last thing that should keep you from going solar. 4) Going solar helps benefit employee satisfaction. A company is only as good as its employees and with greater awareness, today everybody knows about solar. When an employee sees the company investing in solar, it gives a feeling of assurance that the company cares about nature, surroundings, the planet etc and therefore will most likely to treat the employees well. Having solar in your office, therefore, is not just a good economical, but also an HR positive move. While solar is beneficial to people in all walks of life, particularly for small to medium sized businesses would find tremendous value in going solar. If your office or industry is located in New Delhi, Noida, Ghaziabad, Faridabad or one of the surrounding areas, be it Mahendragarh, Manesar, Panipat, Sonepat, Meerut or Rewari, make sure you go ahead and schedule your site survey on MYSUN to be the first ones to benefit from a list of special services, listed for industrial customers or simply call us at +91-9873167009 to talk to our expert solar advisors.